If you hate to end up with a dead gadget just because there is no power outlet in the immediate vicinity, then the PowerMonkey Charger might be just what the doctor ordered. 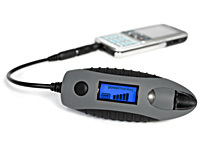 PowerMonkey is a sleek little gadget that provides hours of extra power for portable devices. Think of it as a back-up battery that, once charged, holds its power without leakage for up to a year. Simply plug it into your gizmos and let the juice flow. You’ll never be caught out with a dead battery again. There are two kinds of PowerMonkey, the solar-powered eXplorer and the mains-powered Classic but both models come complete with all kinds of adapters, so you can fire up virtually any device imaginable. The eXplorer even features water-resistant rubberised casing, a folding solar panel and a handy LCD screen that displays remaining charge – ideal for adventurous eco-types who won’t be near an AC socket anytime soon. When you want some more portable power just leave it to soak up a few rays. The Classic and eXplorer models will retail for £29.95 and £64.95, respectively. Sounds like a pretty sound investment if you travel a whole lot.